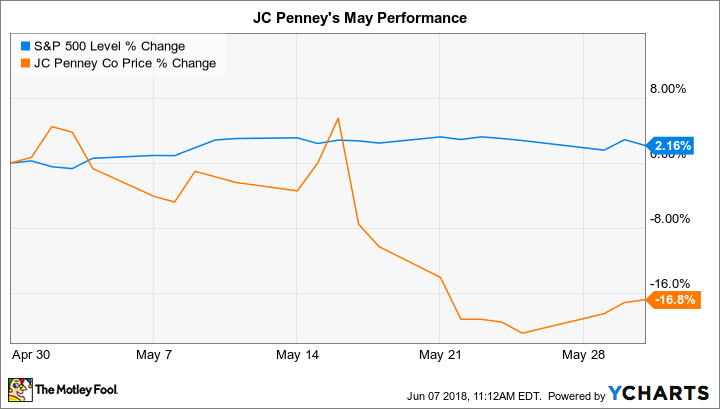 J.C. Penney (NYSE:JCP) stock underperformed the market last month, shedding 17% compared to a 2% increase in the S&P 500, according to data provided by S&P Global Market Intelligence. The dip pushed shares back into negative territory for 2018, with the retailer's stock having lost over 80% of its value since the middle of 2013. May was a difficult month for the business, beginning with a first-quarter earnings report that sent shares 10% lower. In that announcement, J.C. Penney revealed flat sales growth that missed management's targets. The company struggled on the profit side of the business, too, with operating income stopping at just $3 million, or roughly 1% of sales. Investors reacted harshly to news that the gross profit margin, a key reflection of the retailer's pricing power, worsened by 2.4 percentage-points to 33.7% of sales. Later in the month, J.C. Penney announced that CEO Marvin Ellison would be leaving the company to take the top spot at Lowe's. The CEO responsibilities will be shared by four executives going forward, and the management team believes its goal of modest sales growth in 2018 is attainable. As for the earnings challenges, "gross margin improvement is a major focus for the company," executives explained in their quarterly conference call. But it's hard enough to improve margins when customer traffic is robust, and harder still to achieve that result when market share is falling.